One of the funniest truths about travel is that some of the strangest places in the world are right down the road from some of the most quotidian. Case in point: Wat Phra Dhammakaya, the world's largest temple, is so close to Bangkok's Don Mueang Airport that you can see it when your plane is taking off or landing. The only problem? You might not realize it's a temple. That's because, its massive size notwithstanding, Wat Phra Dhammakaya doesn't look like any other temple you've seen, certainly not any temple in Thailand. It's also a great deal more controversial than other Buddhist temples, which isn't saying a lot since Buddhism hasn't made controversy part of its brand. How Big is Wat Phra Dhammakaya? Before you read about the big controversy behind Wat Phra Dhammakaya (and be warned: there is a lot of it), start with a more superficial bigness: The temple's size. Constructed on a huge plot of land (800 acres) in 1970, Wat Phra Dhammakaya has amassed more than 150 buildings during less than 50 years of existence, which now cover more than 320 hectares combined. The center of the grounds is a sphere-shaped stupa (which is unique in and of itself), which is so massive that it is covered with 300,000 Buddha images, all of which are roughly the size of human monks. As far as human capacity, it's difficult to measure exactly how many people can fit on the grounds of the largest temple in the world, although it's tempting to extrapolate a number in the range of several hundreds of thousands: More than 150,000 people can fit into the administrative center assembly hall, which takes up only a portion of the temple's footprint. Indeed, more than 3,000 monks call the temple home on a day-to-day basis, making it the most populous temple in the Kingdom of Thailand. They all subscribe to the same school of Buddhist thought: The Dhammakaya Movement. The controversy surrounding the Dhammakaya Movement and Wat Phra Dhammakaya itself has been as big as the temple. In general, critics accuse the foundation of contributing to and benefitting from the commercialization of Buddhism. Additionally, the massive cost of the world's largest temple, estimated to be around US $1 billion, came entirely from public contributions. Esoterically, many Thais and foreign Buddhists believe the Dhammakaya Movement is a cult, using exaggerated reports of miracles and healing to manipulate people into joining—and giving money. More tangible allegations have ranged from corruption, to embezzlement, to fraud, but although the Thai government brought some of these charges against the foundation, it was ultimately the ruling of the Supreme Sangha Council that exonerated them once and for all, back in 2006. Nine years later, however, it was discovered that a well-known Thai banker named Supachai Srisuppa-aksorn authorized 674 million Thai baht (around US $20 million) worth of fraudulent checks that originated in the temple as "donations," although they were written explicitly to prevent the organization Srisuppa-aksorn represented from becoming insolvent. More entertainingly, the Dhammakaya Movement claimed to know the whereabouts of Steve Jobs' reincarnated soul shortly after his death in 2012. To be fair, however, this viewpoint was never articulated by movement leadership but rather by individual members of the movement, and achieved a level of viral internet fame that was disproportionate to its influence over the larger movement or its doctrine. Of course, the Dhammakaya Movement is not all bad—and its good is not confined only to the existence of Wat Phra Dhammakaya or to the majesty of the largest temple in the world. The other side of accusations that the Dhammakaya Movement has contributed to the commercialization of Buddhism is that its activities have allowed Buddhism to affect the world in more tangible ways. The global success of Dhammakaya Meditation notwithstanding, the Dhammakaya Foundation has contributed to decline in smoking and drinking by Thai people through a variety of public outreach programs, which earned the organization commendation from the World Health Organization in 2004. Additionally, the temple has used its resources to aid smaller temples in Southern Thailand, where Muslim insurgencies often threaten the existence of Buddhist communities. It also transmits its teaching to more than 18 countries around the world, 24 hours per day, thanks to a state-of-the-art satellite network. 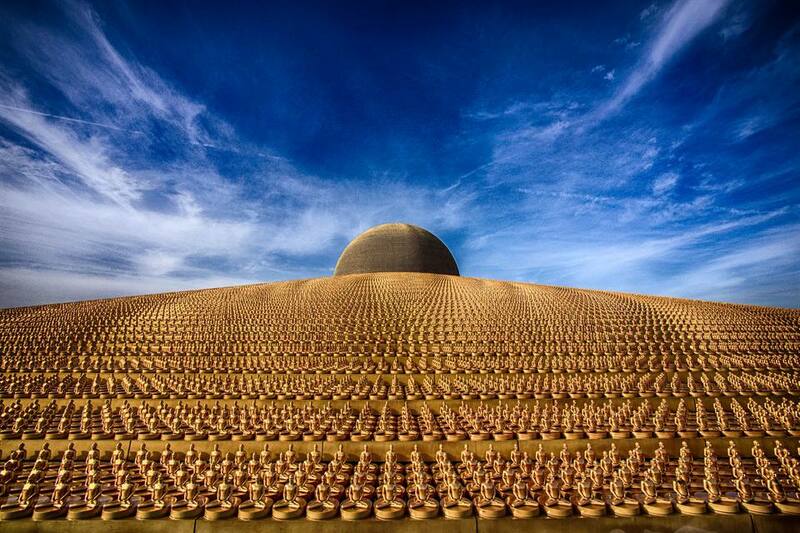 Wat Phra Dhammakaya is located about an hour north of central Bangkok by private car or taxi. Given Bangkok taxi drivers' penchant for charging flat fees instead of obeying the law and using their meters, it's unlikely that you will enjoy the metered rate of travel here, and will instead have to bargain your way to a price—that price will be no less than 500 THB roundtrip, unless you are Thai or speak the language convincingly. Alternatively, a number of public bus services run to Wat Phra Dhammakaya on a regular basis. The Dhammakaya Foundations has a page on its website that lists the latest departure schedules to and from the largest temple in the world. You should note that while Wat Phra Dhammakaya openly welcomes tourists, it is not generally known to be aggressive in its recruitment efforts, at least among non-Thais. On the other hand, it's probably not a good idea to step onto the temple grounds and ask questions about whether or not the organization is a cult. Not because you will have to fear retribution, of course, but out of politeness.